Bold bridal earrings are becoming the biggest wedding trend of 2018! The perfect bridal look is all about the details, as earrings are an accessory that no bride should walk down the aisle without! Although, when it comes to bridal jewellery all eyes are usually on the engagement ring, the wedding band or even the tiara, 2018 is giving us a new wedding trend that is a must for fashionista brides. 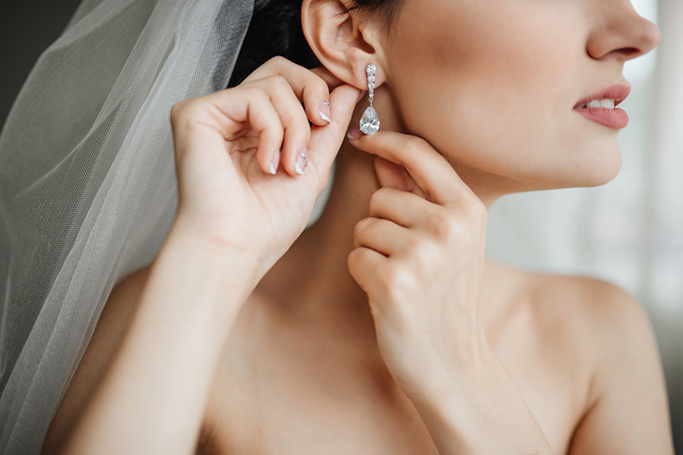 Say hello to statement bridal earrings –the newest accessory to sparkle on your big day! From chandeliers to delicate drops and coloured stones, bridal jewellery is now showcasing a range of statement earrings perfect for any bride. Hoops on your wedding day –yes that’s now a thing, as brides are opting for unique shapes, flamboyant florals and glamourous styles which allow the bride to shine and stand out even more!